Thanky you for Miss Sergeant3's book4. It's one of the few things I've snatched time to read. Won't you please write to Curtis Brown5 for me and tell him whatever you think best6? I am so submerged in letters and things these days. I want to write to you about Mr. Llona7 as soon as I have heard more about them him from friends in Chicago8. His ideas are good. With his wife9's help I think he would make a very interesting translation10. Cather seems to have forwarded a letter from Curtis Brown to Greenslet. 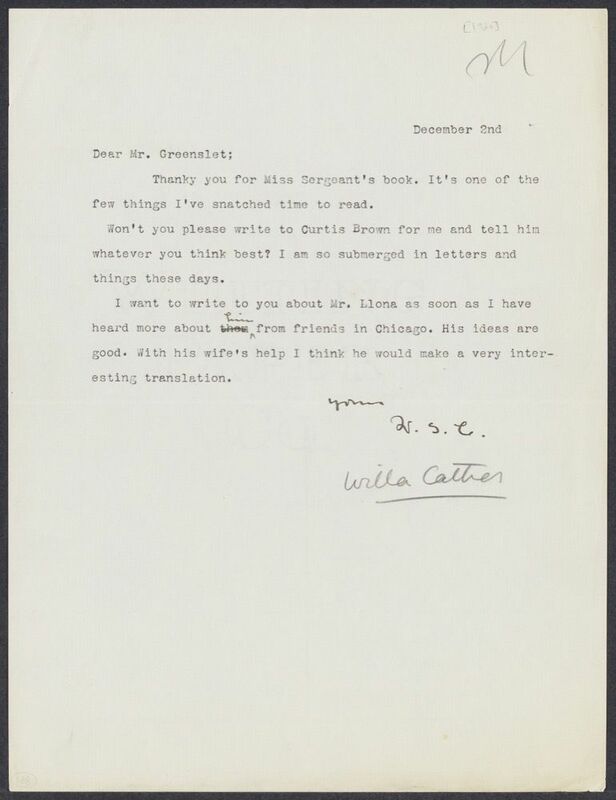 On 3 December 1920, Greenslet wrote he thought "the transfer from Conard to Collins would be in your favor" but reported he would tell Brown that Cather's guaranteed payment should be in dollars rather than pounds sterling. Sergeant, Elizabeth Shepley (1881-1965). American journalist and author. Born and raised in Winchester, MA, a suburb of Boston, Elizabeth Sergeant graduated from Bryn Mawr College in 1903. In 1910, Pauline Brandeis sent her to Cather at McClure’s Magazine with a proposed article, published as “Toilers of the Tenements,” and Cather and Sergeant became lifelong friends. In 1914 Sergeant became one of the original contributors to the New Republic. While on assignment in France in 1917 she was injured by a land mine; her injury and recuperation were the subject of Shadow-Shapes: Journal of a Wounded Woman (1920). She moved to New Mexico in 1920 and became involved with the Taos artists colony and advocated for Native American rights, but her work frequently took her back to New York City. She included Cather in her collection of portraits of prominent Americans, Fire under the Andes (1927). Sergeant studied with Carl Jung and Toni Woolf in Zurich, Switzerland, from 1929 to 1931. When she returned to the U.S. she sold her house in New Mexico and settled in New York City, writing many magazine articles about authors and psychological topics. She later moved to Rockland County, NY. Cather’s letters to Sergeant comment frequently on both her own and Sergeant’s writing and testify to a strong and lively friendship maintained despite Sergeant's being a committed reformer and far to the left of Cather politically and culturally. Sergeant’s Willa Cather: A Memoir (1953) includes extensive paraphrases of Cather’s letters to her. 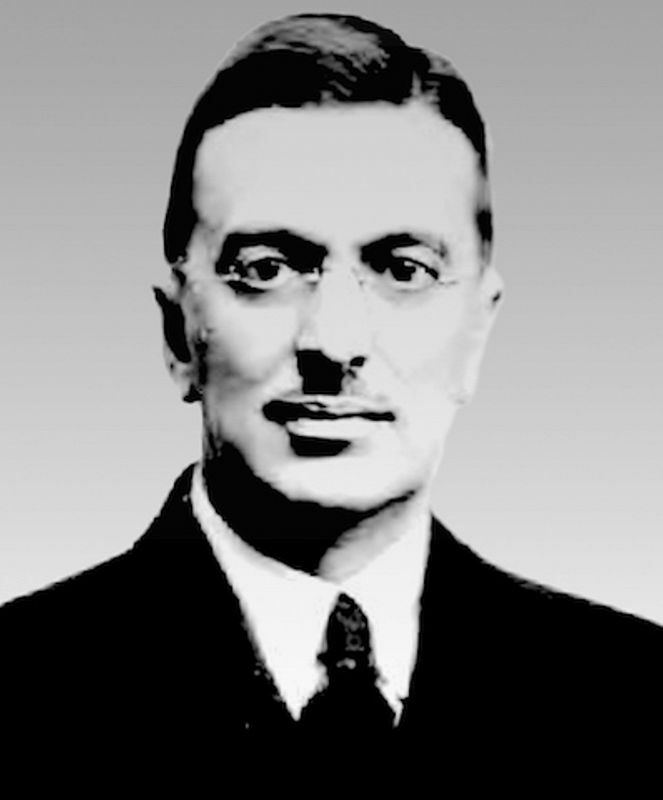 Llona, Victor Manuel (1886-1953). Peruvian-French writer and translator. Born in Lima, Peru, Victor Llona was raised and educated in Paris, France, where he entered the cosmopolitan café scene as a teenager. In 1906 he moved with his parents to Chicago, IL, returned to Paris in 1913 but left for New York City at the outbreak of World War I. On his return to France he became friends with both French and American expatriate writers and launched a career translating dozens of American novels into French. His translation of Cather’s My Ántonia (1918), Mon Antonia (1920), was one of his earliest translations. Before his return to France he married Florence Nelson of Chicago. They had two children, Doris and Eric, and his wife collaborated with him on some of his translations. The couple later divorced. Llona, Florence Mildred Nelson (1901-1977). American translator. Born in Chicago, IL, Florence Nelson married Victor Llona, then living in Chicago, and moved with him to Paris, France, where their children Doris and Eric were born. In the 1920s and 1930s in collaboration with her husband and independently she translated prose fiction and nonfiction from English to French and from French to English. The couple later divorced.